This month, my colleagues and I wrote to NYC Dept of Transportation Commissioner Margaret Forgione to support the continuation of the Clinton/Hell's Kitchen Neighborhood Traffic Study. This study will help improve safety and mobility for pedestrians, cyclists, and motorists, and help determine resource and funding priorities for DOT. In our letter, we ask that this study remain active until four critical items have been reviewed, and implementation dates have been established for each. Among these items are (1) analyzing intersections with high pedestrian fatalities; (2) alleviating congestion with alternative traffic configurations and associated signage; (3) establishing an evening peak period contra-flow bus lane; and (4) obtaining commitment from NYPD or the Port Authority to provide resources. I thank DOT for the work done so far on the study, which has already advanced improvements in the area. Considering the area's recent surge in development, this study remains relevant and timely. Last month I submitted testimony to the City Council Finance Committee in support of the proposed Hudson Yards/Hell's Kitchen Alliance Business Improvement District (BID). After more than a year and a half of consulting with community stakeholders, elected official s, and the community at-large, this BID is ready to be formed. In my testimony, I supported Community Board 4's requests for the BID to ensure transparency in its operations, cooperate with the community, preserve the diversity of our neighborhoods, and appoint residential tenants to its Board. If approved by the NYC Council Finance Committee, this measure will go before the full Council and, if passed, will go to the mayor for his signature. I look forward to continue working with the Hudson Yards/Hell's Kitchen Alliance BID. In October, the GEM Hotel, at 300 West 22nd Street, applied to Community Board 4 for a Beer and Wine License for the hotel's rooftop space. If this license were granted, the space would be open to the general public; the space is currently limited to hotel patrons and their guests. The rooftop space sits below, and is surrounded by, residential apartments with windows directly above and adjacent to the space, likely resulting in increased noise from the rooftop. In October, I signed onto a letter drafted by State Senator Brad Hoylman to the State Liquor Authority asking for careful review of the forthcoming application. The hotel says it commissioned a sound study which showed there would be no increase in noise from the expanded use of the roof. On Nov. 21, I sent a letter, also signed by NYS Senator Brad Hoylman and NYC Council Speaker Christine Quinn, to the GEM Hotel asking for the public release of the study. We also suggested that the hotel consult with NYC's Dept. of Environmental Protection to learn how they could mitigate an increase in noise. We have not received a reply. 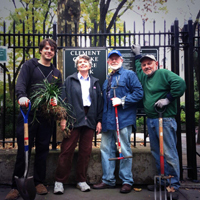 I enjoyed helping to clean and beautify the Clement Clarke Moore Park with Allen Oster, Mary Swartz, and Clayton Harley of the W. 400 Block Association on Sun., November 17th. Thanks to the collective efforts of elected officials, community leaders, and residents of Chelsea, the US Postal Service scrapped its plan to sell the Old Chelsea Station on West 18th Street. We were outraged that the USPS gave little public notice of the proposed sale, and many residents only found out about it by reading a confusing memo at the building's entrance. The Colonial Revival building is a historic landmark and a beloved community asset. It would have been a shame for the building to be sold without any public input or review. I was glad that, along with my colleagues Congressman Jerrold Nadler and Senator Brad Hoylman, we were able to convince the USPS to hold a public meeting about the proposed sale in April. This episode serves as an example of the power of a vocal, active community working with its local officials. I look forward to continue working with residents to protect and preserve historic landmarks in our neighborhoods. As chair of the Assembly Health Committee, I will be holding two hearings regarding my bill, A.6357/S.4406, which would allow patients with cancer and other severe debilitating conditions to use marijuana medicinally under a doctor's supervision. The first is in Buffalo on Thurs., Dec. 5, and the second is in Long Island on Dec. 18. My community office at 242 West 27th Street offers free notary service on Tues. and Wed., 10am to 4pm. If you have any questions, feel free to call my staff there at 212-807-7900. This month I sent my thanks to the Tenth Precinct's "Cop of the Month" for outstanding service. Officer Thomas Donegan was recognized for his dedication and professionalism in serving our City. I deeply appreciate the compassion and courage our officers put into keeping our City safe. I applaud them for their hard work, and the commander of the Tenth, Capt. David Miller, for having the "Cop of the Month" program to recognize it. Over the summer, I submitted testimony to the Landmarks Preservation Commission to support the designation of the former Tammany Hall building at 100-102 East 17th St. The Commission voted unanimously to designate it. Built in 1928 in the Colonial Revival style and designed by architects Thompson Holmes & Converse and Charles H. Meyers, it features sculptural reliefs in limestone and terra cotta. Although it was created as the third (and last) home for the Tammany Society (the New York County Democratic organization), it continued to function as a center of art and political communities after the Society left. In 1943, it was purchased by the International Ladies' Garment Workers Union and was used as a central meeting place for union activists. Later, it became a performance and theater space. This building is an important piece of New York City history and architecture. It has also been designated as a National Historic landmark by the Federal government. Each year in New York, rent controlled tenants pay a 7.5% increase in their "maximum collectibles rent" until, in theory, the rent reaches the amount of a Maximum Base Rent (MBR). But the MBR keeps rising, so the MCR keeps rising. Rent Controlled tenants consistently face higher percentage rent increases than Rent Stabilized tenants. This year the Division of Housing and Community Renewal (HCR) has proposed to increase the MBR by 8.3%. If this proposal is accepted, it will mean that rent controlled tenants, which are by far the oldest and generally among the poorest group of tenants with fixed incomes, will face another 7.5% rent increase in the following year. On November 22, I testified at the New York State Division of Housing and Community Renewal's Maximum Base Rent Increase Public Hearing and urged DHCR to reject this increase. The MBR system must be changed. The MCR increases should be limited to no more than the Rent Stabilization increase established by the Rent Guidelines Board. I support Assembly Member Linda Rosenthal's bill to do that.